The unofficial start to summer is here! This brings up the important topic of vacations and keeping things going for your business while you tune out, and how to keep your customers happy. After all, you deserve a day off every now and again, and a vacation, right? If you’re planning on taking time off, it’s important to make sure your customers are receiving the kind of attention and care they expect from you but also know you are not available in the immediate. This has become a delicate balance as we also have to be careful how much information we give out to the world. Here are a few suggestions to help keep your customers happy, prevent them from getting frustrated and allow you some downtime. For incoming calls, update your voicemail to pick up right away. Change your outgoing voice message to an out-of-office style, so people know your response might be delayed. You don’t need to tell them your miles from home and at the beach, just a generic “I’m out of the office, checking messages periodically (if that’s true), and will get back to you as soon as possible (or offer a timeframe).” Or something similar that doesn’t let the cat out of the bag your office and home studio are wide open and unattended for the week. Make certain there is adequate room to cover your call volume. Consider hiring an answering service for your office line if it’s not a phone you take with you. 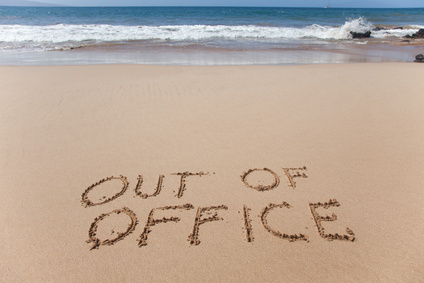 Consider sending an alert email, stating you’ll be out-of-the-office 1-2 weeks prior to your departure.Take advantage of this communication and encourage your customers to place any orders they might need from “this” week through “the week after your return” so they don’t miss any important gifts or needs they might have for their own vacation. Set up an “out of office” email response for the span of time you’re away so your customers get a reply to any communications they send to you. This can be a generic style note as you have no control over who will receive your automatic reply and you don’t want to be sharing with the world you’re not on premises. For your website e-commerce page, your Etsy site, or other online store you have, set yourself to “vacation mode” so people understand there might be a delay in responding or shipping. Again, you don’t need to be specific on the dates or the “where” you’ll be but it’s important those who are looking for one of your handmade jewelry items knows they won’t be able to get your regular standard of service. You may reach your customers in ways other than what we’ve listed here, simply adapt these ideas to your business’ needs so you are sure to communicate effectively with your clientele. You work hard all year to build your list and keep your customers happy, if you think ahead before taking a little time off, you really should be able to tune out and recharge without missing a beat upon your return. Have a comment or an out-of-office idea to share, we’d love to have you add to our list. Please leave a comment below.